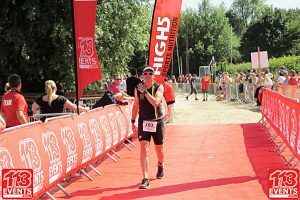 Following Mallorca 70.3 I had TATA Steelman Olympic distance two weeks later and Cotswold 113 another fortnight after that. Still not over virus I decided to skip Steelman the night before the race. Only a week before the race I ran a 5K in what was probably the slowest time I can remember, a rather pedestrian 31 minutes, despite my heart rate being off the charts. However, a few days later I did a short bike ride and felt 100% better. In the midweek without even really meaning to I ended up running a sub 24 minute 5K which is as fast as I’ve gone in a while. We pack all my kit on the Friday night using my now obligatory checklist and find I’m missing one of the arm sleeves that served me so well in Mallorca. Probably eaten by the washing machine, stuck inside something else or maybe still in the Balearics. Not being one to cope well with these sorts of things after a long while of Kathryn and I looking I send a hopeful email off to the race organiser. Doesn’t make a lot of sense at this point in the story but I actually got them from the Cotswold 113 race a few years back and I wondered if they might have a few left over gathering dust in a box. Within minutes I had a reply saying they’d pop some behind the desk at registration for me. Can’t fault that for service especially when you consider less than 36 hours before his race the guy was probably quite busy. So, on to race weekend. K and I left Alex with grandparents and headed down to the Cotswolds around midday on the Saturday with the car packed up and my bike on the stand I’d made with my dad, which allows me to stand it in the boot nicely and not take up too much space. It does however require me to drop the saddle down and put it back when I need it. I know the height though so it should be an easy job. More on that later. We arrive at the race, attend the non-mandatory briefing and I get given a brand-new pair of sleeves. I noticed they were in fact selling them on a table at the event and offered to pay for them but Graeme wouldn’t hear it – that is the kind of race director that you can’t help but admire. I will return the favour by marshalling for him sometime soon. The hotel restaurant is fully booked for the evening but having not had lunch we decide to have a bar meal around 4pm and get an early night. I have a rather healthy by my usual standards chicken and pasta dish and a short walk later we settle in for the evening. As per usual I don’t sleep much but I do get more than I did before Mallorca – never more than 30 minutes in a go but I do get some deep sleep in that time. Alarm goes off at 4am (transition opens at 4:30 and I start in wave 2 at 6:10) and I make up some instant porridge and we head out to the race. K helps me unpack the bike and I pop the wheels back on, check the brakes, gears etc. and put the saddle up to its correct position (832mm from the centre of the bottom bracket). I’m putting my bike in transition when someone points out that despite being 10 yards away we can barely see the lake. I’d been on site 30 minutes by that point and hadn’t noticed and indeed shortly after one of the marshals comes in and tells everyone that the start has been delayed 30 minutes. I finish organising my stuff and join the toilet queue which takes a little longer than ideal only to return and find that we’ve been delayed another 30 minutes. Communication from the staff was very good though and the situation clearly explained in terms of water safety and the potential for a reduced swim. The 200-300m swim they suggest sounds fantastic to me! Eventually the lake clears for the requisite length of time and we’re going to start at 7:30. Still a while to wait and I’m a bit hungry at this point but the pancake I eat might as well be coated in glue as my mouth is so dry. Wave 1 starts, we have our quick briefing lakeside and get in. A few minutes to acclimatise and we’re off. Very quickly I’m last and for some reason finding it hard to swim in a straight line as I keep veering to the right. I know it’s costing me time but I’m happy that Wave 3 haven’t yet caught me. That happens at around 600m or so when the wave 3 leader comes past me like a speedboat. For the rest of the race I’m steadily overtaken by people as expected and I count the waves passing me and realise even by my standards I’m going slowly. I also note that I’m consistently 10 yards right of the traffic which shows I’m not exactly swimming the optimum route. I get on the bike and immediately have a problem – I haven’t tightened the seat post enough and it drops to the bottom – I ride around the corner and find somewhere to pull over to look at it. Slight problem – my new multitool doesn’t have a 7mm allen key. I get back on and ride some more, not fast, and with my flashy bike and knees hitting my elbows I must look like some sort of idiot. I find someone and borrow an allen key and tighten it up and everything is so much better but alas that doesn’t last 3 miles. I try to flag down a couple of motorbike mechanics with no joy and the one climb on the course is a proper struggle in the compromised position. At about 35K I hear a bike coming and flag him down before he passes this time. He has a proper wrench and bit and I do the seat post tight as I dare without a measurable torque. From then on my ride picks up – I complete the loop and see Kathryn amongst the large number of supporters and tell her that my second lap is going to be much faster. The second loop goes by almost without incident and where I averaged about 24kph for the first 35K and near enough 30 for the remainder. That one incident is on a narrow section where 3 cars coming the other way almost force me off the road – the first two were actually ok but the last one unaware of my presence less so. I’m past 80K and realise that despite my frequent stops and screwed up opening section I’m actually on for a distance PB and keep the hammer down overtaking dozens of bikes in the last stretch. That’s when I learn a valuable lesson. I approach the dismount line too fast, the official at the line stands in front of me and in order to stop in time I brake too hard, and a little bit harder on the front wheel. I go over the handlebars and onto the road. I get back up as K comes running out from the other side of the gate into transition and the marshals are trying to convince me to sit down. I feel fine though, mostly feeling stupid and concerned for my bike. I pick it up and feeling ok wheel it back to the racks and get ready for the run. A little bit shook up but ok I head onto the run course. However, with a few hundred metres done I realise that perhaps I’ve damaged my collarbone or shoulder or something as the pain is very apparent. I soon realise that I can’t really run without it really hurting and making me feel a little dizzy so I walk. I resolve to walk a lap (the course is 3x7K) and see how it goes. After the first lap I have a word with the ambulance people and ask “if I hypothetically had a broken collarbone how much further damage could I do by walking another two hours?”. The answer suggests that as long as I don’t run I’ll probably be ok. So I do. Taking basically an hour per lap at a good walking pace with the weather now really hot. The marshals are very supportive, especially the few from our club (thanks you lot) and as long as people don’t try too hard to get me to run I’m feeling OK – I almost wanted my arm strapped up at this point just to explain the walk. Kathryn runs around a lot to see me at regular intervals to check on me and would have done the distance with me if I’d let her. I take my mind of the pain by talking to other competitors, thanking marshals at every opportunity and cheering on others by name running towards me in the 2 way sections. I get to the line eventually and collect my medal, by this point not really feeling any sense of achievement but happy to avoid a DNF. I then head to the medical tent where the medic puts me in a sling and suggests a trip to A&E. Two hours later we’ve packed up the car and driven to the Royal Gwent A&E department. 6 hours after that and nearly midnight I’m told nothing is broken but I’ve separated my collarbone and shoulder. Could have been worse I guess. Doc did mention that I may have made it worse by starting the run but equally it might have made no difference. So not the perfect race by any means but I have learned a number of lessons that I’ll hopefully take something from. if I’m going to persist in minimal swim training at least do some OW swimming and learn to do it in a straight line. I measured it 100m long and actually most seem to have had it short. It’s a bit of a strange feeling, although that could be the painkillers, but finishing this race hasn’t really given me any satisfaction because I underperformed physically, mentally and mechanically throughout the day. I’d be more annoyed had I not finished and possibly when I can actually give the bike a proper check over I’ll feel better. I think the fact that my season might be over has deflated me somewhat. 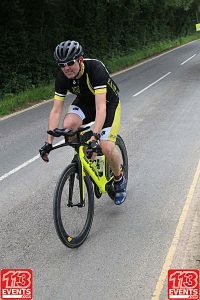 I’m supposed to be doing 3 events at LCW in a month – that might not happen, and then riding this bike course again in August as part of a NEWT relay team. If it wasn’t for the injury I’d be wanting to go sub 3 – so let’s see how this injury is in a week or two. I also have to say thanks to Kathryn, my teammates, the 113 events team who are excellent, the marshals and supporters who helped get me round. Oh yeah and the cyclist who very nearly helped me and the mechanic who then actually could. Plus the medic and the A&E staff. I’d better stop or I’ll be going all night.